This entry was posted on July 28, 2014 at 10:19 am and is filed under Biographical with tags Brighton, Lightning, Rain, Thunder, Weather. You can follow any responses to this entry through the RSS 2.0 feed. You can leave a response, or trackback from your own site. It is less unusual for water to get in during torrential rain than people think; torrential rain is really quite rare in Britain, and of short duration. Nevertheless it’s not a nice thing and if you live in rental accommodation then it’s important to inform the landlord both to give him the option to plug leaks and to cover yourself. There is said to be a gush of rain in the vicinity of lightning strikes (supposing it actually is raining there and then), due I think to dramatic reduction in the electric field that had been holding up electrically charged raindrops against gravity. Does anybody know if this is accurate? 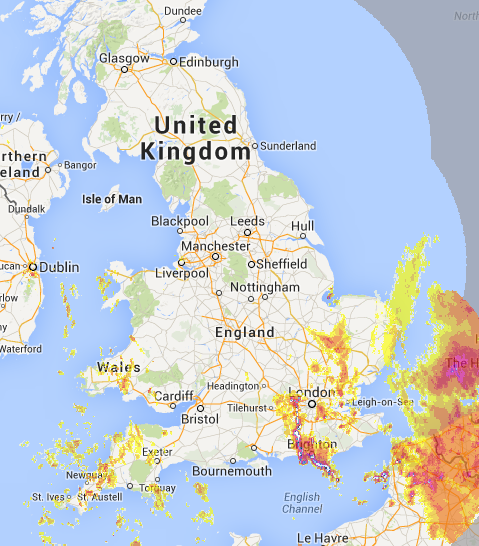 I’m glad that that map shows nothing over Southampton where the Test Match is on. I think what generally happens in such very heavy downpours is that the flood of surface water gets in behind the flashing joining roof sections together. I had the same problem in Nottingham when water ran down the sloped roof against a chimney stack then splashed over the flashing and in through the roof. It’s a big problem for old roofs, with old fashioned lead flashing which degrades over time. I’m not disputing it, but how does lead degrade? Lead doesn’t suffer from oxidation problems (actually it does a bit, but the oxide tends to form a protective layer on the surface). The problem tends to arise with the sheets of leading from which the flashing is made expanding and/or contracting with changes in temperature and thus working free from the fixing, or sometimes tearing if it has been fixed too strongly, which allows water to get in behind. Too bad they didn’t call the paper “Goodness gracious, Great balls of fire”.